Happy Saturday everyone! I hope you are having a fantastic weekend! I made this card for a sketch challenge over on Crazy 4 Challenges. I also made it for Crafty Creations Challenge, which was to use embossing.. any type... I used heat and dry. Cindy offered a great sketch but I just had to tweak it a bit and widen my center grid. But that's called "artistic license", right? 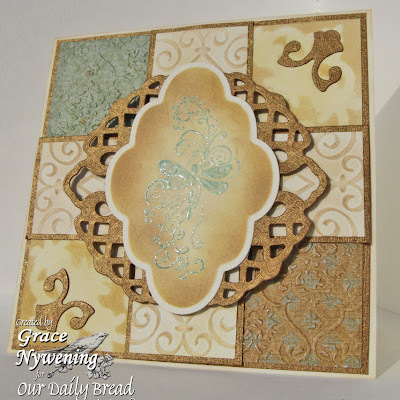 Anyhoo, I used the newly released Our Daily Bread Designs set, Friendship for my image. I stamped into Versamark then Sage Shadow and clear embossed. I cut with my Nesties Label #6, embossed in the Big Shot, then sponged with T Holtz Distress Ink, and Color Box Creamy Brown Chalk Ink while still in the die, thus creating the vanilla border. My base is Very Vanilla, matted in textured "Solid Pearl Gold" CS from The Paper Studio. I used my Nestie Lattice Pendant to cut out the gold cs as well, and used the punched out pieces in two of the corners. The Dp is from K&Co Ancestry, and embossed with the CB Textile embossing folder. The other two corners are very vanilla, then masked with Tattered Angels Glimmer Screens (in the small size). I sponged around them with T Holtz and Color Box Creamy Brown Chalk Ink. I love the effect I got but I covered much of it up with my corner cut outs. I need to do this more... really pretty! There are so many fun screens available and the possiblities are endless! My very vanilla center divisions are embossed with the Sizzix Wedding EF, then sponged with Color Box Creamy Brown Chalk Ink. The image is mounted on the lattice panel and that is popped up on dimensionals. My sentiment will go inside. If you have not seen this month's new releases yet at Our Daily Bread, you should take a look! There are three great sets, all using doodled butterflies or dragonflies, and they include great sentiments for "Thinking of You", "Friendship" and "Get Well". These doodled images are perfectly suited to quick card making because you don't have to color them... just stamp and go! They can be dressed up or down as you like. I just love working with them! I hope you have a wonderful weekend and are blessed beyond belief! Thanks for stopping by! By the way... don't forget there's still time to enter the current Our Daily Bread designs Challenge, THREE FOR THEE, which is to make a pocket card... any type, any number of pockets... and link it to the ODBD Blog post by Thurs. Sept 17. Three of the newly released sets will be given away to thrree lucky winners! Don't miss out!!! Grace this is soooo beautiful, I LOVE all your squares, and texture!!! Gorgeous work Grace! Have a wonderful weekend...HUGS! Somehow I don't think this was a 'stamp and go' card for you! :) A lot of description of all the hard work and thought and creativity you put into this card. It is lovely. Goodness, Grace, what an amazing and absolutely elegant card!!!!! WOW, I am at awe with the colors and the warmth of this card!!! A masterpiece waiting to be framed. Wow, the card is beautiful! !I love the color combo. Beautiful card, and while I was visiting your blog I got to listen to that wonderful Chris Tomlin. He is my absolute favorite of contemporary Christian artists. Thanks for sharing your talents and the message in song!! A double blessing!!! Thanks for joining us at Crafty Creations with this beautiful card! Hi grace! I hope your having a lovely sunday. :) we're getting a lot of rain here! this is a beautiful card! and I love your new blog layout!! beautiful!!! Grace, this is absolutely BEAUTIFUL! Thanks for playing with us this week! Hi Grace! How fabulous to see you playing the Crafty Creations challenge!! Your card is so beautiful, love all the texture and lovely embossed image!! Hope you'll play again soon! Grace, this is so beautiful!!! Wonderful colors, design, and detailing!!! Gorgeous scripture card!!! Grace, this is absolutely beautiful! This is gorgeous Grace!! I love the textured panels! And your colors are so soft and soothing to the eye! Stunning!! Everything about this card is beautiful! Love the colors, the embossing, and the elegant feel to the card.